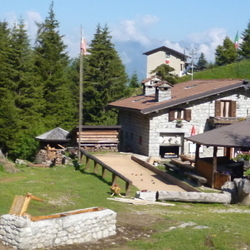 Colombe` Hut is located in Valcamonica, in the municipality of Paspardo at 1710m of altitude. 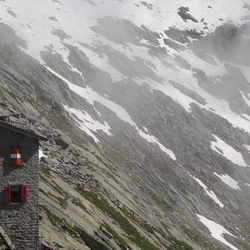 – From the hut, stopover of Trail Italia, several hikes are available to reach the Mount Colombè summits, from Peak Barbignaga (2.367m), of Porta Pass (continuing along the trail n° 117), of Corno delle Pile (2.899m) -Tredenus Group- , of Pizzo Badile Camuno (2.435m). Moreover, the Hut you can reach the Lake Arno (crossing the Porta Pass, or through the comfortable trail of Tre Fratelli n°22); a lake that, for its shape and position, reminds the Norwegian fjords.